For outdoor enthusiasts, bringing your bike is a must especially if you’re traveling long distance destinations. However, you can’t stash your bike at the back of your SUV. It will not fit and can most likely damage the bike. That’s why you should consider investing in the best bicycle racks for SUVs. A bicycle rack is a convenient and hassle-free method when it comes to transporting heavy outdoor gears. 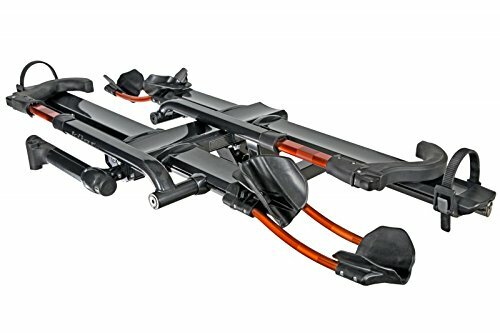 Let’s start with this budget-friendly bicycle rack from Tyger Auto. This rack is designed to fit minivans, SUVs, and Sedans. Make sure that your vehicle doesn’t have rear spoilers for perfect compatibility. It can accommodate up to three bikes at the same time thanks to its sturdy metal construction. The padded lower frame will keep the distance of your bike from the vehicle to prevent accidental scratches. Safety straps are also included in the package. Moreover, its soft cradles are designed to shield your bicycle frame and secure its safety while traveling. The OE standard black E-coating can resist rust and corrosion in the long run. You can install this bike rack in just a couple of minutes as it comes fully assembled. Also, you can fold the bike rack when not in use. 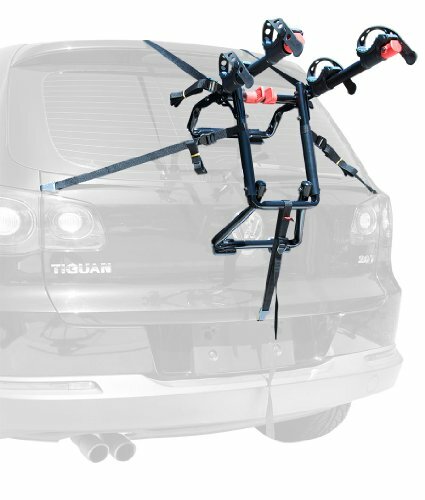 The Allen Sports premier bike rack features a patent pending design that is compatible with minivans, SUVs, and hatchbacks. Thanks to its quick snap-set design, you can easily set it up upon receiving the product. It features 12-inch long carry arms that can hold up to two bicycles at a time with a maximum capacity of 70 pounds. It also has an individual compound tie-down cradles that will shield your bicycle while traveling. The two patented straps will keep the bottom hooks while in use. Moreover, it has extra-large car pads that can distribute the bike load evenly and protects the finishing of your car. You can visit the manufacturer’s website to know the exact vehicle fit information. The Swagman two-bike mount rack offers durability and security at an affordable price. 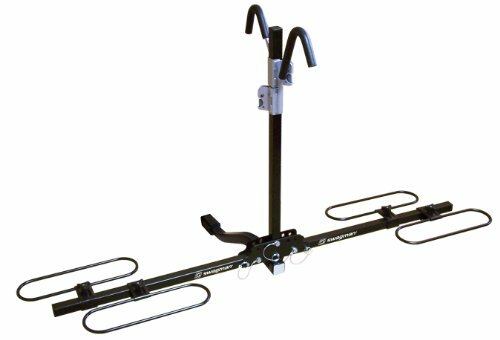 This mount rack features a locking hitch pin and 10mm security cable (not included in the package) and fat tire wheel trays (sold separately). It can fit a 1-1/4 inch and 2-inch hitch receiver. The maximum capacity of this mount rack is approximately 70 pounds. Furthermore, the center arm is collapsible, allowing you to access the rear of your car without having to remove the rack from the back. It has upright ratcheting arms that you can adjust according to the size of your bike’s frame. 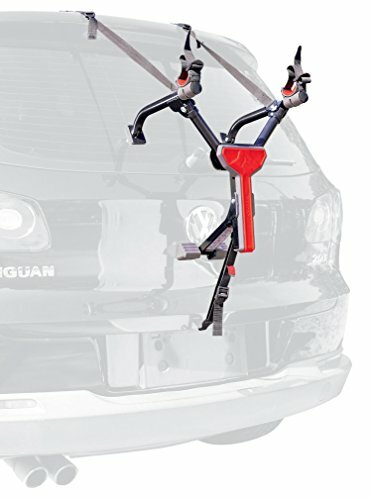 Transporting your bikes has never been more comfortable with its integrated anti-wobble hitch device. Owning an electric bike means looking for a heavy-duty mount rack that can accommodate its heavy weight. Introducing the Sports Rider for Electric Bikes. This mount rack can accommodate up to two electric bikes weighing up to 80 pounds each. Thanks to its heavy duty wheel holders, you have the confidence in carrying massive load capacity and the sturdy base system for a hassle-free loading and unloading of the bikes. When not in use, you can fold up the rack and tilt it down. In that way, it will not block the cargo access. It’s lightweight and easy to store as well. The frame is compatible with 2-inch hitches only and includes a keyed same hitch pin and 8-feet cable. Note that this rack is not compatible with trailer, towed, or fifth wheel vehicles. 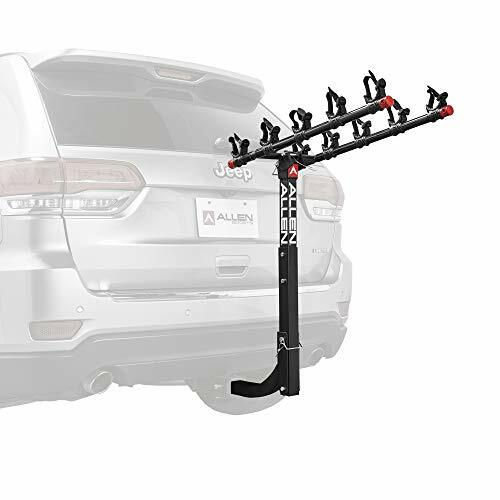 Another budget-friendly product from Allen Sports, we have the ultra-compact mounted bike rack. It is made of quality steel that can resist rust and corrosion in the long run. This one-bike carrier can be used for daily commuting and traveling. You can fold it up into a small piece of metal and put it inside a carrying bag when not in use. Also, the three full legs rest against the vehicle, securing the stability of the bike and your car’s finishing. It also has three adjustable security straps to hold the bike while traveling. The tie-downs and padding work by keeping the bike secure even on bumpy roads. 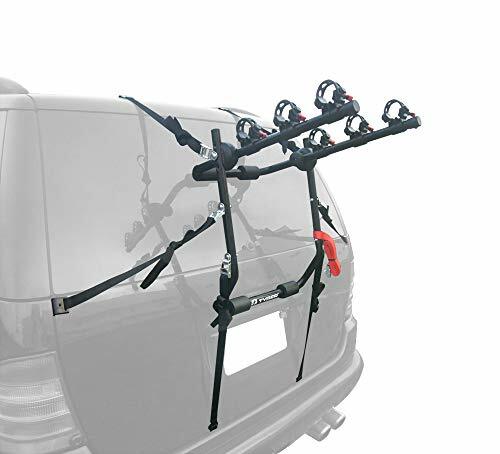 This mount bike rack is suitable for minivans, hatchbacks, and SUVs. We also have the Swagman chinook bike rack. This mount bike rack can accommodate two bikes at a time and fits most frame sizes. Also, the wheel ratchet straps will keep the bike in place while traveling. It can fit up to 1-1/4-inch and 2-inch hitch receiver. You can tilt it down to access the rear of your vehicle, even if the bikes are loaded. The locking hooks are adjustable, securing the frame to the rack. Included in the package is the locking hitch pin, making it easier to load and unload the bicycles anytime you want. You can fold it up against the vehicle when the rack is not in use. 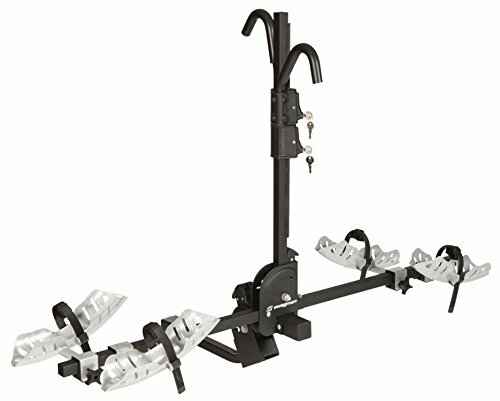 Another product from Allen Sports, we have the deluxe hitch mounted bike rack. This rack is ideal is ideal for multiple bike owners as it can accommodate up to five bikes at a time. It is only compatible with vehicles that have a 2-inch trailer hitch. In addition to that, it also has a 28-inch long carry arm that can secure the bicycles using the Allen’s patented tie-down system. Its folding wings can quickly drop out of the way if you are not using the rack. You can assemble this mount bike rack in less than five minutes. The frame is made of sturdy steel with black powder coat finish. Buyers can enjoy a lifetime warranty upon buying the product. 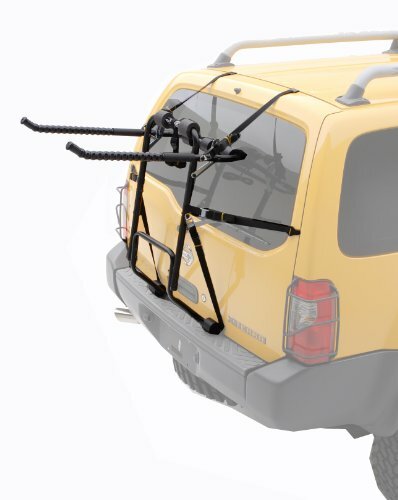 If your budget permits, check out the Kuat Racks NV 2.0 bike rack. It features an adjustable front tire cradle system and a re-designed pivot with an optional foot assist. The fully-integrated cable locks secure the bikes while in use. The package already includes a trail doc, and its front tire ratchet with intuitive release makes unloading and loading the bike a breeze. The bike cable locks are longer compared to their previous models, adding security to the bikes even if you travel bumpy roads. The metal frame is coated with premium gloss metallic powder with water transferred logos. 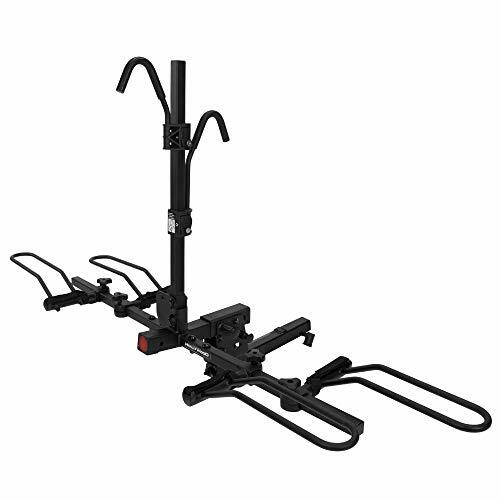 For our last item, we have the Hollywood Racks F4 heavy-duty mount rack that can accommodate up to four bikes. This mount bike rack is heavy-duty and easy to adjust. Rest assured that it will not damage your vehicles. As for the assembly, you need not worry because it comes pre-assembled. It also comes with a day glow safety lag. The exclusive dual positioning trunk/bumper system allows you to custom fit the rack on your SUV, sedan, or minivan. The extra-heavy-duty steel tubing and hardware ensures that your bike doesn’t wobble even when going through bumpy roads. It has motorcycle tie down buckles and an integrated tie-down strap that will secure your bikes.